In 1652 during the Anglo-Dutch Wars, hostilities between England and the Netherlands spilled over into North America. The Dutch settlers of Manhattan Island, called New Amsterdam at the time, feared England was planning to attack and constructed a wooden wall as defense. AAPL – I would not buy AAPL at current levels because it is rangebound and the momentum is neutral. In addition, the technology SPDR (XLK) is testing its uptrend and support. The recent highs for AAPL were around $160. I would consider buying it if it broke through that level. The recent lows were around $140. I would consider selling it below that level. Have you ever wondered why the sandwich that you pay $10 for now was just $7 five years ago? This chart scares me. And it should scare you too. It shows the national debt as a percentage of the Gross Domestic Product. In 1975 it was 33%. Now it’s over 100%. This is scary because it will eventually cause massive inflation. This is a result of the government creating new money because it is not able to cover its costs. Let’s talk about how this works. If the Government prints money it causes inflation because when there is more money chasing the same amount of goods in an economy, prices will inevitably rise. For example, if there is just $10 in an economy and just one product then the product will cost $10. If the government prints another $10 there is now $20 in the economy so that same product will now cost $20. That is how inflation happens. If the USA was a company we would have declared bankruptcy decades ago. Eventually, something is going give and it wont be pretty. From a weekly perspective, this is the most oversold the SPYs have been since September of 2011. 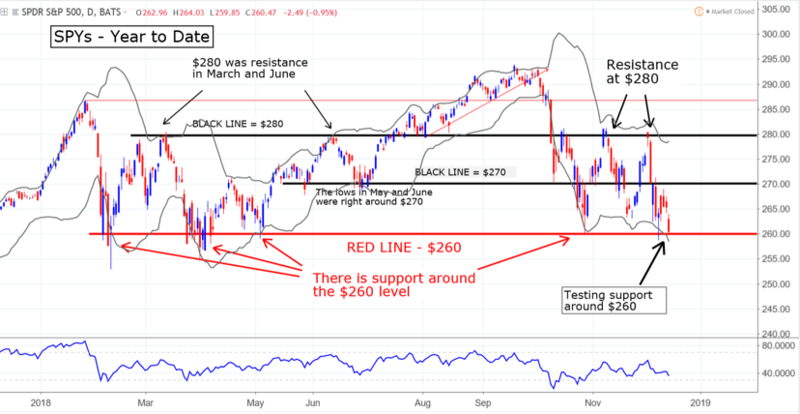 S&P 500 – The SPYs are testing support around the very important $260 level. This is where the lows from February through May, October, and again in the first week of December. There is an important difference this time however. During the prior times they were oversold and now they are not. When markets are overbought or oversold when testing important resistance or support they tend to revert and that is what happened before. When markets get to important levels and consolidate they tend to break through and those dynamics are currently occurring. If it breaks there will probably be a meaningful selloff because there are no clearly defined levels of support between current levels and the $240 level.